Namaste and Happy New Moon/Winter Solstice! I hope this finds you in good spirits and enjoying this beautiful time of year. We’ve been blessed with cool weather here in South Florida, perfect for getting into the holiday spirit, and it’s the last new moon of the year and the wheel of time turns once again with the upcoming Winter Solstice. Gaia’s rhythms affect us deeply. We’re forever ebbing and flowing with her, we need only slow down enough to sense her lead. The dark mysterious nature of a new moon is ripe with possibilities and awaits planting of your seeds. This New Moon is calling us to clean our corners and internal cobwebs. Ya know, the ones buried in the clutter of lifetime beliefs, habits, and ways of being that have been on replay, for well, who knows how long. Be it a thought pattern, fear, doubt, relationship pattern, perhaps a job, or the story looping in your mind, dust it off and make space for the new. Our Sagittarius Moon flirts with our true essence and potential. 2017 has been about releasing and creating new beginnings. It’s time to step into this new version of ourselves, to be fully reborn in this moment of the wheel. My holiday offering to you is Brahmari Breath. (Click Image for Video) It’s said to make honey in the heart with sounds of the buzzing bee, your soul bee. It’s a simple yet powerful meditation utilizing breath and sound to dust those internal shelves. LOL, It’ll clear the books and clothes no longer serving you, too. Your breath creates an internal symphony and is calling you with its song, go ahead already, dance with it! 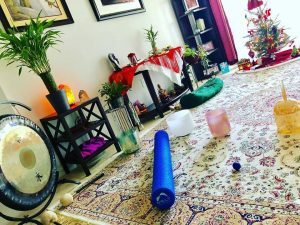 “Regardless of what type of yoga we practice or the path we follow, we are all ultimately sonic yogis, transforming ourselves through vibrations and sound so that our frequency and consciousness align with the primal sound current that creates all spirit and nature, energy and matter, soul and body.” ~ Mehtab Benton, Gong Yoga. Once you’ve allowed time to clear stagnant energy, set your intentions, plant them in this newly tilled and fertile soil. The Winter Solstice will mark the longest night of the year and is a very auspicious time as Gaia’s cycles shift yet again. The days will begin to grow as Grandfather Sun embarks on his six-month journey toward Summer Solstice, ultimately nurturing our seeds and teaching us light always exists with dark. They are passionate partners on this dance floor we call life and shouldn’t shy away from either. Find time to dance in this powerful portal of mystery and possibility as we welcome this last New Moon of 2017 and our Winter Solstice. Make space for your dreams during this potent lunar and seasonal cycle of rebirth. As we navigate closer towards our transition to a new year, let us be clear in our visions, our new creations, endeavors, adventures, and breathe the sweet breath of this life we are gifted. ❤️ I’m stoked about my new Livestream/recording set up. My classes/videos sound like you’re with me in person, and the instruments, oh they are magick. I’m so grateful for the guys at Forever Dope Media who helped me in capturing the essence of my bowls and gong for livestreams and recordings. Check out my EVENT CALENDER for more info on my Tuesday and Friday Livestream classes. ❤️ Our next sound bath is set. We’ll prep body, mind, and spirit for our transition from one year to the next! I’m excited to be with you all under the light of Grandmother Moon to bathe and move in the sonic vibes. 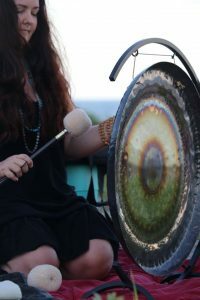 Join us, The Crystal Vibe Tribe on New Year’s Eve for our next Full Moon Sound Bath followed by a Kirtan (Mantra Chanting). ❤️ I’ll be seeing you in the New Year with lots of exciting news about a new phase of my website, which begins in January! 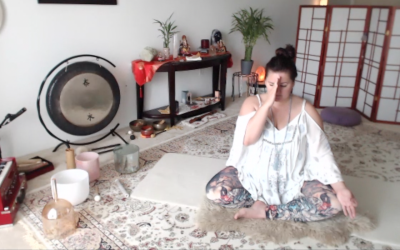 I’ll have more information about my meditation challenge, upcoming course, and news of my next adventures including a level one Gong Training in Sarasota to Cape Town, South Africa, and Amsterdam! I love you already 2018!